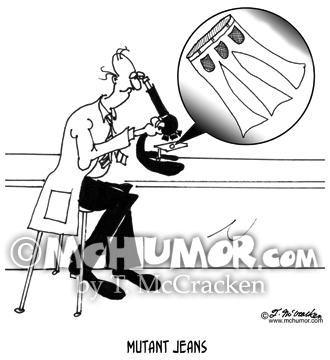 Biology Cartoon 1031: "Mutant Jeans." 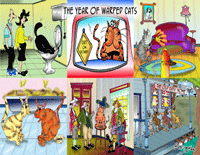 A scientist looks in a microscope at a cell shaped like a three-legged pair of jeans. 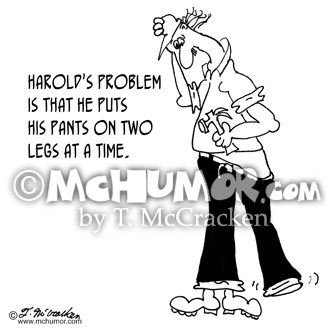 Pants Cartoon 6141: "Harold's problem is that he puts his pants on two legs at a time." 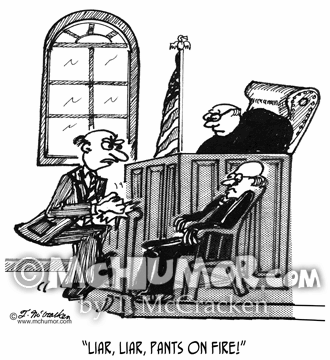 A carpenter has both his feet sticking out one pants leg. 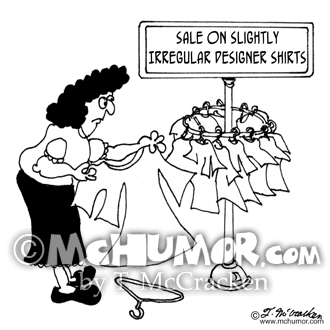 Designer Cartoon 6726: A store has a "Sale On Slightly Irregular Designer Shirts." A woman looks at shirts with three arms. 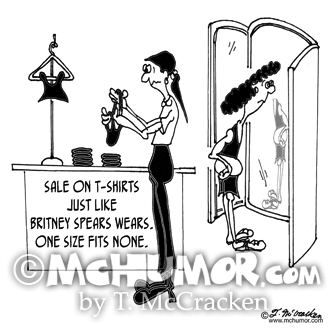 Clothing Cartoon 7851: A store advertises "Sale on T-shirts just like Britney Spears wears. 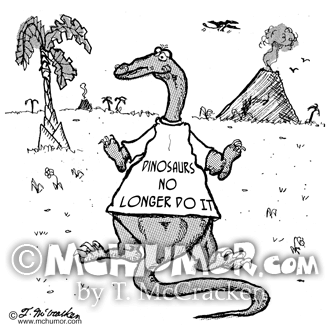 One Size Fits None." 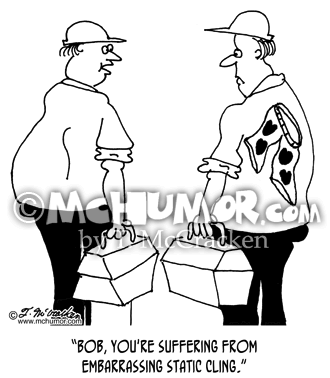 The shirts are really skimpy and everyone, no matter how small they are, bulge out of them. 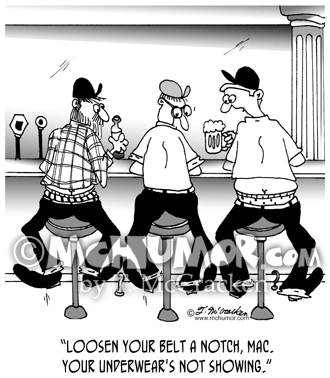 Underwear Cartoon 6079: A construction worker says to another with a pair of heart covered boxer shorts stuck on his back, "Bob, you're suffering from embarrassing static cling." 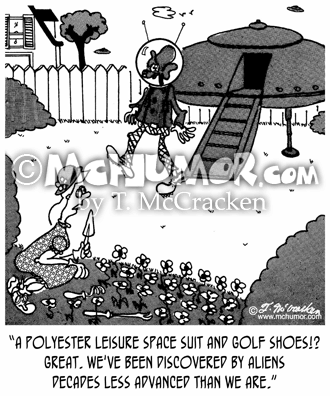 Fashion Cartoon 5080: A woman looking at a space alien stepping off a flying saucer and saying, "A polyester leisure space suit and golf shoes? We've been discovered by aliens twenty years less advanced than we are." 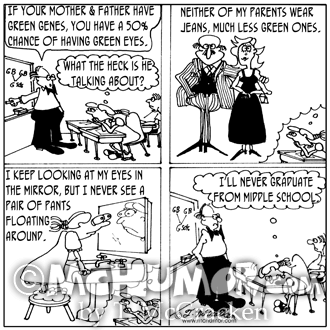 Biology Cartoon 4600: A) A science teacher says, "If your mother and father have green genes, you have a 50% chance of having green eyes." A girl thinks, "What the heck is he talking about?" B) The girl imagines her straight-laced parents and thinks, "Neither of my parents wear jeans, much less green ones." C) The girl looking in a mirror thinks, "I keep looking at my eyes in the mirror, but I never see a pair of pants floating around." D) She bangs her head on her desk and thinks, "I'll never graduate from middle school."